Planned Parenthood: A Thorn In Abortion Foes' Sides The organization is the nation's largest single provider of abortions, yet it gets millions of dollars in federal funding with which to provide other services. Efforts over nearly three decades to change that have been unsuccessful — infuriating abortion opponents. Anti-abortion activists protest outside the office of House Speaker John Boehner (R-OH) in February. A lot of people were surprised when House Republicans' desire to eliminate federal funding for Planned Parenthood very nearly caused the shutdown of the federal government last week. But those who have watched the abortion debate over a long period of time were not surprised. Despite the successes members of the anti-abortion movement have had over the years in restricting the procedure, "Planned Parenthood remains the thorn in their side," says Deana Rohlinger, associate professor of sociology at Florida State University. 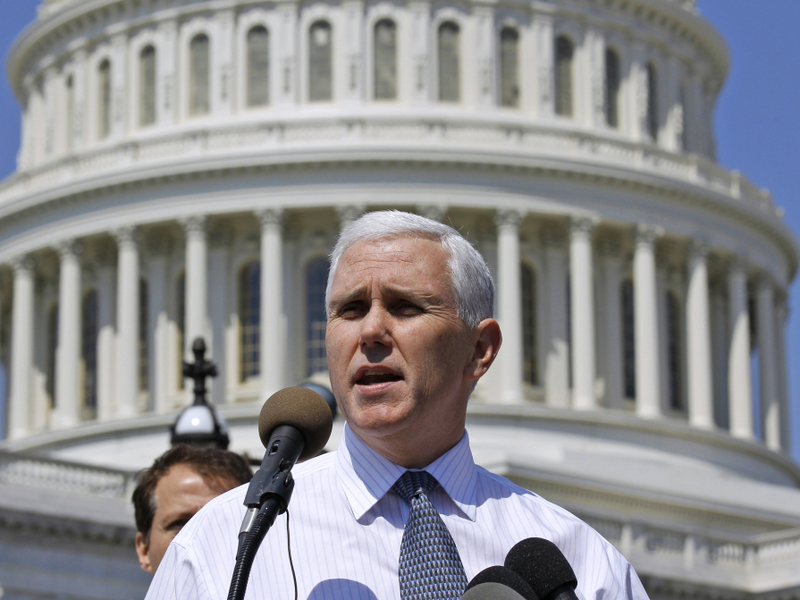 Rep. Mike Pence (R-IN) introduced legislation to defund Planned Parenthood in January. Planned Parenthood is the nation's largest single provider of abortions, yet it gets millions of dollars in federal funding with which to provide other services. Efforts to change that have been unsuccessful not only with this last go-round, but also stretching back nearly three decades. That makes abortion opponents see red. "I would assume that most Americans would be surprised, if not shocked, to learn that the largest abortion provider in America is also the largest recipient of federal funding under Title X," Rep. Mike Pence (R-IN) said in January when he introduced legislation to strip Planned Parenthood of its federal funding. Title X is the federal family planning program. While the use of federal funds for abortion has been banned since the 1970s, and for the entire history of the family planning program, that is only a technicality to Pence and his anti-abortion allies. "There's no question that money that Planned Parenthood receives for its operational expenses from the federal government frees up resources that can be used to provide and promote abortions through its abortion clinics," he said on the House floor during a similarly unsuccessful attempt to defund the organization in 2009. In fact, efforts to separate Planned Parenthood from its federal funding date back to the 1980s. One of the earliest efforts came in 1982, near the start of the Reagan administration. A regulation quickly dubbed the "squeal rule" would have required family planning providers to notify a minor's parents if she obtained prescription contraceptives from a Title X clinic. The rule was overturned in federal court after Planned Parenthood and others sued, charging it violated patient confidentiality. [Planned Parenthood] basically stands in the way of its primary goal, which is to make the abortion procedure inaccessible in the U.S. In 1987, the Reagan administration issued what came to be known as the "gag rule." It overturned longstanding family planning regulations that required that women with unintended pregnancies be advised of all of their legal options: keeping the baby, adoption or abortion. The new rules said federally funded family planning clinics could no longer provide abortion counseling. This time, Planned Parenthood lost. In 1991, in Rust v. Sullivan, a divided Supreme Court ruled 5-4 that the government could bar abortion counseling. But continued legal wrangling kept the rules from being implemented until after President Bill Clinton took office, and he rescinded them. They have never been re-imposed. And so Planned Parenthood remains a major grantee of the family planning program, much to the consternation of people like Marjorie Dannenfelser, president of the Susan B. Anthony List. The organization works to elect anti-abortion female candidates and has been running one of several anti-Planned Parenthood efforts. "It is the biggest abortion franchise in the nation. One in 10 of its clients receive abortions," Dannenfelser said on NPR's Talk of the Nation last month. "A quarter of abortions occurring in this nation are performed by Planned Parenthood clinics." Both statistics are true. But Planned Parenthood also does a lot more, points out Cecile Richards, Planned Parenthood's president. "Last year we provided nearly 1 million pap smears, 830,000 breast exams, nearly 4 million tests and treatments for [sexually transmitted diseases], including HIV," she said. In fact, Richards notes, 1 in 5 women in the United States has visited a Planned Parenthood clinic. For many women, going to Planned Parenthood is about more than just getting birth control. "For more than half our patients, Planned Parenthood is the only nurse or doctor they will see all year," she says. All of that makes the organization highly popular — and makes anti-abortion activists that much more irritated that Planned Parenthood continues to get federal funding: about $360 million in 2009, the last year for which statistics are available. Florida State professor Rohlinger says what the anti-abortion movement hates most about Planned Parenthood is its persistence: "It basically stands in the way of its primary goal, which is to make the abortion procedure inaccessible in the U.S."
Indeed, over the years, the anti-abortion movement has had a lot of success in cutting back on abortions by putting various limitations on abortion clinics — things like requiring certain types of equipment or special paperwork. But those limitations pretty much haven't worked on Planned Parenthood, which still has 84 affiliates with 800 clinics in every state except North Dakota. "Planned Parenthood has been pretty resistant to this and has by and large refused to quit offering the procedure despite these different hurdles," Rohlinger says. 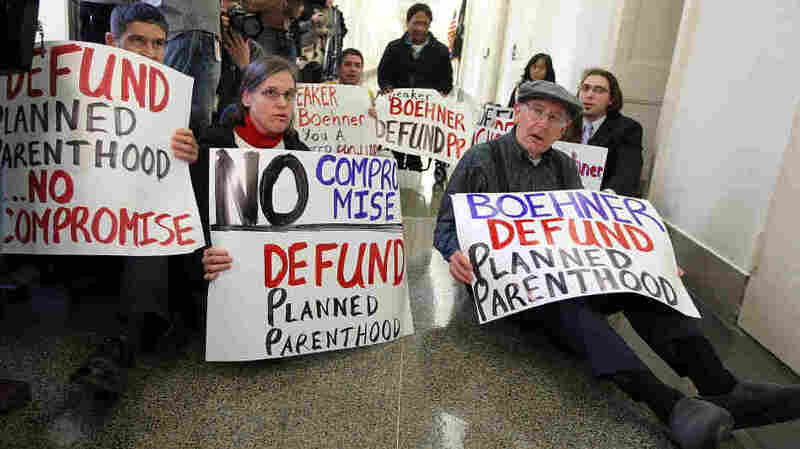 Anti-abortion lawmakers have also found Planned Parenthood to be a common enemy they can point to to rally their base. But that hasn't always been easy, either. "They've really tried to challenge the notion that Planned Parenthood is a family planning organization," Rohlinger says, "and have tried to associate them solely with the abortion issue. And it hasn't been very successful." Just last Friday, for example, Republican Sen. John Kyl of Arizona said on the Senate floor that "if you want an abortion, you go to Planned Parenthood. And that's well over 90 percent of what Planned Parenthood does." In fact, just the opposite is true; well over 90 percent of what Planned Parenthood does is NOT abortion. Kyl's office later said his speech "wasn't intended to be a factual statement," which, among other things, got him ridiculed by both Jon Stewart and Stephen Colbert. The bottom line, however, is that making Planned Parenthood a target is probably good for those on both sides of the abortion debate. Politico reports that online contributions to Planned Parenthood have grown by 500 percent since the House passed the bill that would have stripped its federal funding. Meanwhile, says Rohlinger, Republicans can use attempts to defund the group "to regain the confidence of its conservative base, particularly among the social conservatives." As elections approach, many anti-abortion activists have been complaining that Republicans have not gone far enough to try to end the practice. "So Planned Parenthood is a really convenient and good rallying point," she says. And that is why the fight is unlikely to end anytime soon.